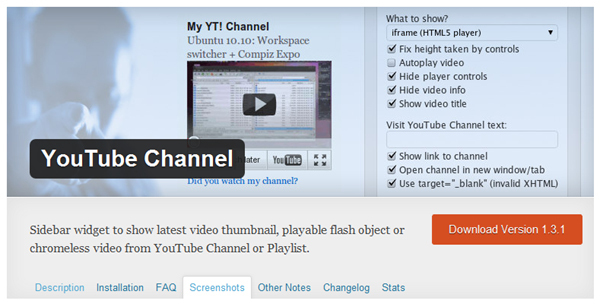 In addition to showcasing the latest video, you can also make the title of each video to be displayed. And if it allows applications that exist on this widget can be directly integrated with some keywords that exist in an article. From some of the features available in this video, more usually used to help display the keywords to be used. Meanwhile, another feature that is interesting enough to be used including the channel and play list, the newest video thumbnails, popular video widgets, and several other applications. If you are interested, this plugin already supports the latest version of wordpress, so it is quite easy for you to use plug it in, either at the side bar, or in some locations there are, of course adjusted to the theme you use. From these features, there are several other interesting features that can be tried, such as player controls hide, hide video info, video show title, and much more interesting some of the facilities to try.